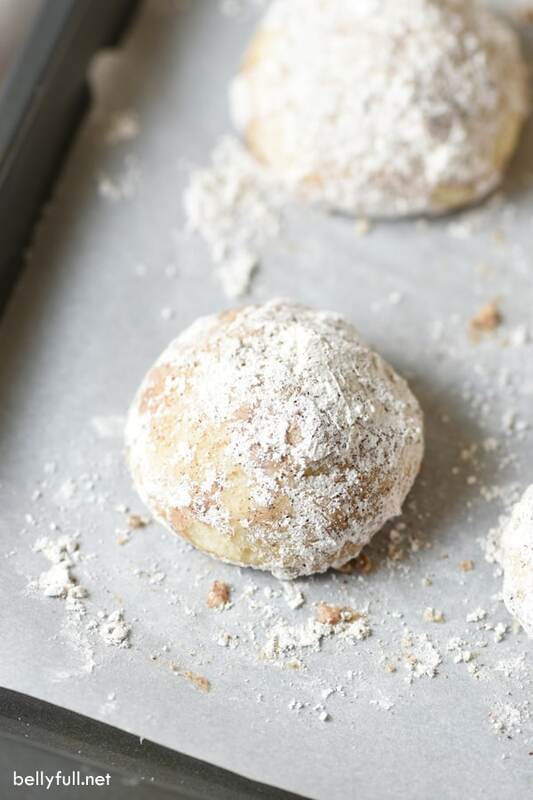 These tender chai-spiced snowball cookies are a fantastic holiday cookie or great served with coffee! Alright. So you guys know I’m all about quick and easy weeknight meals, right? I mean, obviously. But there’s also a part of me who loves to stretch my cooking skills and tackle recipes that are more…involved, let’s say. Especially on the weekends or for a dinner party. A lot of the time, I turn to my friend Jen at Savory Simple. 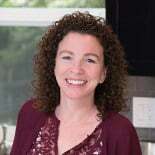 She’s a culinary school graduate, who applies her professional skills for the home cook. 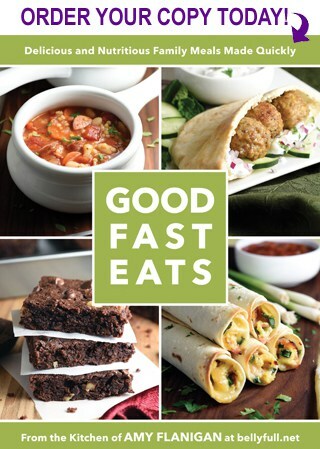 And her recipes are top notch, filled with fresh produce, bold flavors, and vibrant color! 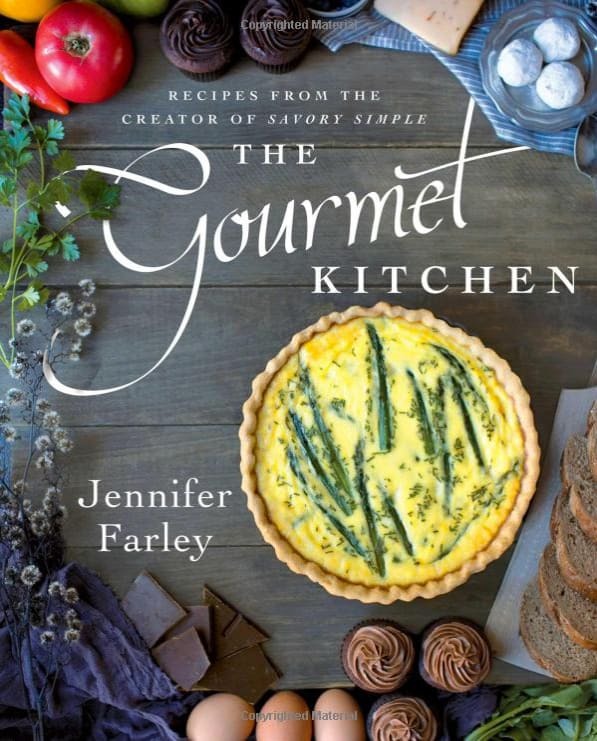 So, it was no surprise when her cookbook, The Gourmet Kitchen, was released. And I couldn’t wait to get my hands on it! WHAT IT’S ABOUT? From-scratch home cooked meals, elevated to a gourmet level. Filled with recipes of varying cultures and styles from around the world, twists on some classics, and essential know-how for beginner cooks and accomplished chefs alike. Chapters include Homemade Stocks, Breakfast and Brunch, Soups and Salad, Appetizers and Sides, Main Courses, and Sweets and Treats. WHAT KINDS OF RECIPES ARE INCLUDED? There is an abundance of healthy fruit and vegetable focused recipes, alongside chicken, pork, beef, seafood, vegetarian, desserts, and gluten free options. DO I NEED SPECIAL EQUIPMENT? Yes and no. Most of the recipes just require a chef’s knife and your basic saucepan. But others call for a quiche pan, food mill, digital scale, ice cream machine, and stand mixer. That shouldn’t deter you from getting the book at all, though. You can improvise or just skip those recipes. There are certainly a ton to choose from! WHAT IS THE LEVEL OF DIFFICULTY? I would say moderate. This book, IMHO, is not for the novice cook. But if you’re comfortable in the kitchen and cook regularly, you won’t struggle. You just need time. ARE THERE A LOT OF PICTURES IN THE BOOK? Yes! 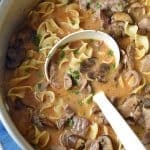 With the exception of a small chapter devoted to Homemade Stocks, all 100+ recipes are accompanied by a stunning photo. DO I RECOMMEND THIS COOKBOOK? Absolutely! It was everything I thought it would be. Upscale, yet totally accessible, unique, and gorgeous. Now let’s talk about these Snowball cookies! (Also known as Snowdrops, Mexican Wedding Cookies, and Russian Tea Cookies. I mean, how many names can one cookie have??!) I call them snowballs because…well, they look like snowballs. And they are one of my all-time weaknesses when it comes to homemade cookies. This recipe was actually one of four that I tested for Jen when she was writing her manuscript. I fell in love immediately and have since made them several more times. 8YO Trevor begs for them. This is surprising considering the chai-spiced coating. But I guess any cookie that calls for two sticks of butter and powdered sugar is bound to be a winner no matter how old you are! NOTE: you might have a little sticker shock when you go to buy the ingredients for these cookies. Cardamon and almond flour don’t come cheap, my friends. But…BUT…these cookies are so beyond delicious, you will make them many more times. Plus, if you do enjoy Cardamom, Jen has several other recipes in her book that call for it, so it will not go to waste. 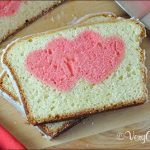 Watch the video and see how easy they are to make! 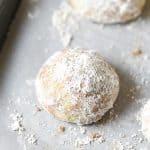 These tender snowball cookies are made with butter, all-purpose flour, almond flour, and powdered sugar, then tossed in a chai-spiced mixture. 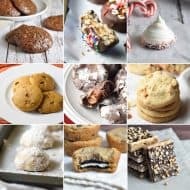 They are a fantastic holiday cookie or great served with coffee! 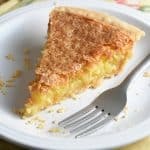 In a large bowl, cream together the butter, a 1/2 cup of the powdered sugar, and vanilla on high with a handheld electric or stand mixer, until light and fluffy. Turn the mixer down to low and add in the almond flour, followed by the all-purpose flour, scraping down the bowls once or twice. 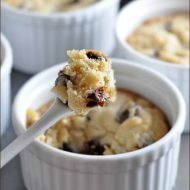 Using a tablespoon-sized cookie scoop, measure out the dough and form balls with your hands. Place on baking sheets. Chill cookies in the refrigerator for 20 minutes. Preheat oven to 325 degrees F. Bake cookies for 18-20 minutes. While cookies are cooking, whisk together the remaining 1 cup of powdered sugar, the cinnamon, cardamom, allspice, and ginger in a bowl. Remove cookies from the oven and allow to sit for 1-2 minutes, then gently coat them with the spice mixture. Set aside to cool for 15 minutes, then toss them in the spice mixture again. I made these for Christmas. I am always nervous about the dough the first time I make a cookie recipe. This dough was perfect. My scoop was a 1.5 inch, so they were a bit bigger. The coating was very fragrant. I liked the taste, but it was a bit strong. Would only do the cinnamon and sugar next time. They do go great with coffee. 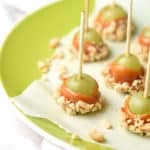 Made these yesterday for Cinco de Mayo and they were a hit! The flavor and texture is on point. Thanks for the recipe! Hello! =) would it be possible to make the dough ahead and freeze until needed? Would they cook frozen or thawed? Hi Jessica – I have never made these in advance myself, but the general rule with most cookie dough is if it has a lot butter or fat, it will freeze well. 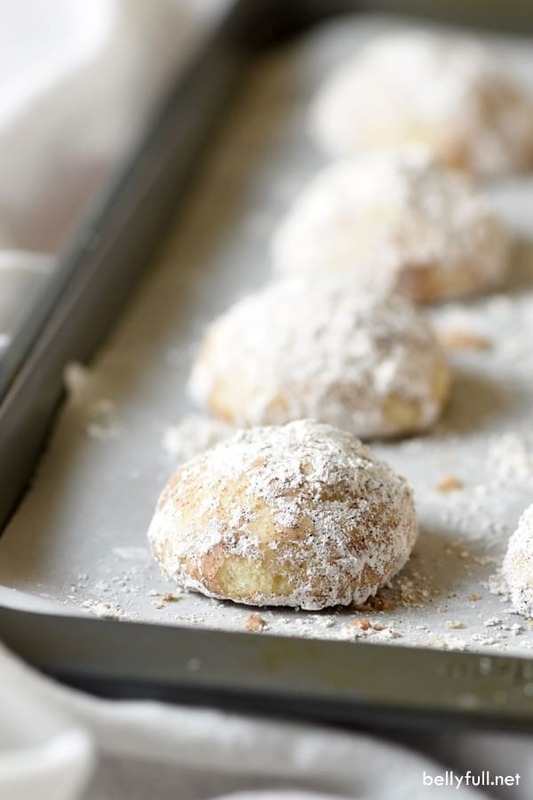 For these in particular, form the dough balls without the powdered sugar spice mixture; place onto a baking sheet (make sure they don’t touch each other), freeze and then transfer to freezer bags. When it’s time to bake, let the balls defrost while you preheat the oven, then roll them in spice mixture right before baking. This was my favorite cookie recipe last Christmas. This year I’m going to play around and try to make them GF. If worried about the cost of spices, try buying small amounts where they sell them in bulk, like Whole Foods. So much cheaper and fresher. 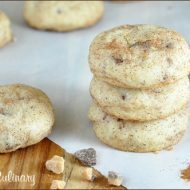 Have you tried adding the spices to the dough as well as the powder sugar coating, to get their complex toasted flavor as well as the bright raw flavor? No. I think the amount of spice is perfect, as is. But you could try it! This is on my Amazon Christmas Wish List, so I’m really FINGERS CROSSED that someone will get it for me…otherwise I might just have to gift it to myself! I’m pretty sure I wouldn’t be able to stop once I started on these babies…I love Jen’s book!